Chicken Tikka Masala is a regular for us. 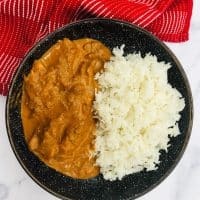 I’m all about minimal ingredients and simple steps when making dinner, and so this easy chicken tikka masala is the perfect recipe to throw in the Instant Pot. 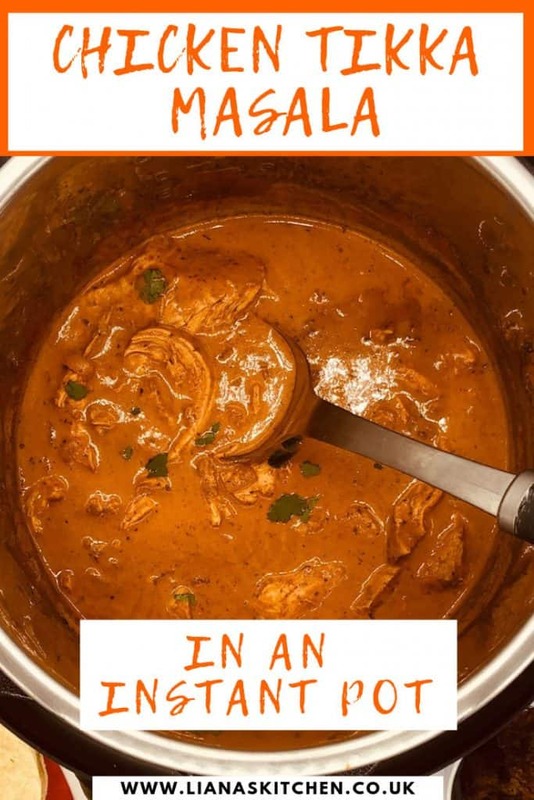 But, now, back to the easy chicken tikka masala recipe! Sauté onions and garlic for a few minutes. Add in the spice mix and stir to coat the onions and garlic. I like to add a little bit of the chicken stock at this stage to create a paste as well as deglaze the bottom of the Instant Pot inner bowl. Make sure you scrape away any spices stuck to the base. I then add in the chicken breasts (whole) and quickly sear them on each side, letting them get coated in the masala paste mix. I usually sear them for about 1 minute on each side, just enough for the meat to seal. With the sauté function still on, add the passata and stock. Give everything a good stir to ensure there is nothing stuck to the bottom. 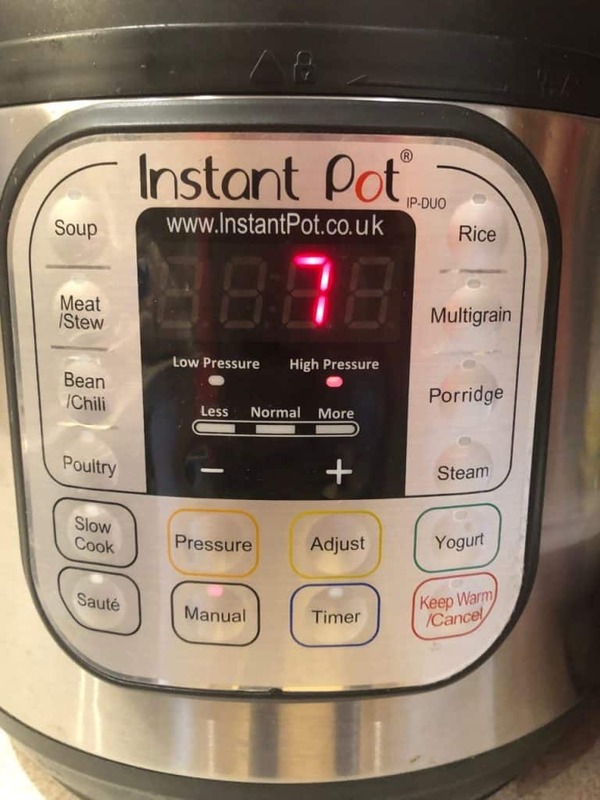 Set the Instant Pot to high pressure for 7 minutes. It will take about 6 minutes to come to pressure. When it has finished do a quick release. 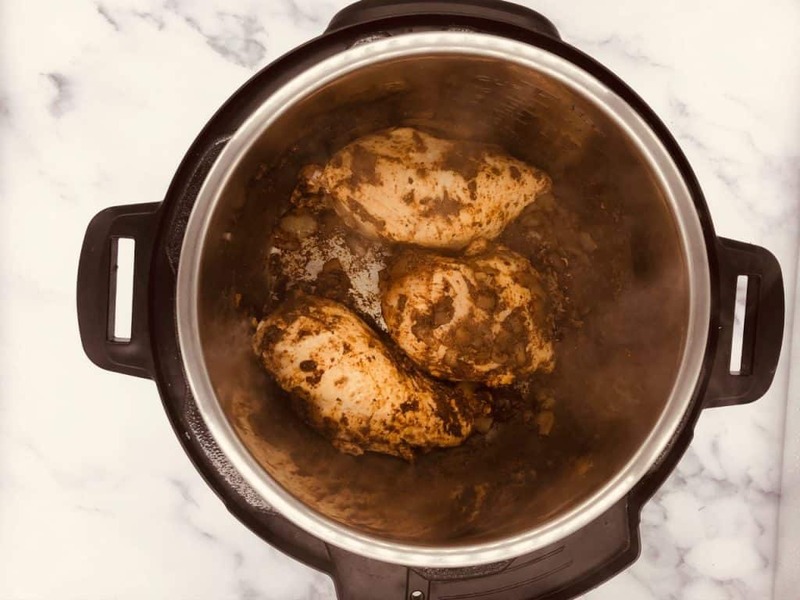 Remove the lid from the Instant Pot and using some tongs take out the chicken breasts. Switch the Instant Pot to the sauté function to allow the sauce to thicken up. In the meantime shred up the cooked chicken breasts. Once shredded, put them back in the Instant Pot. Add in your cream (or substitute) and stir through. 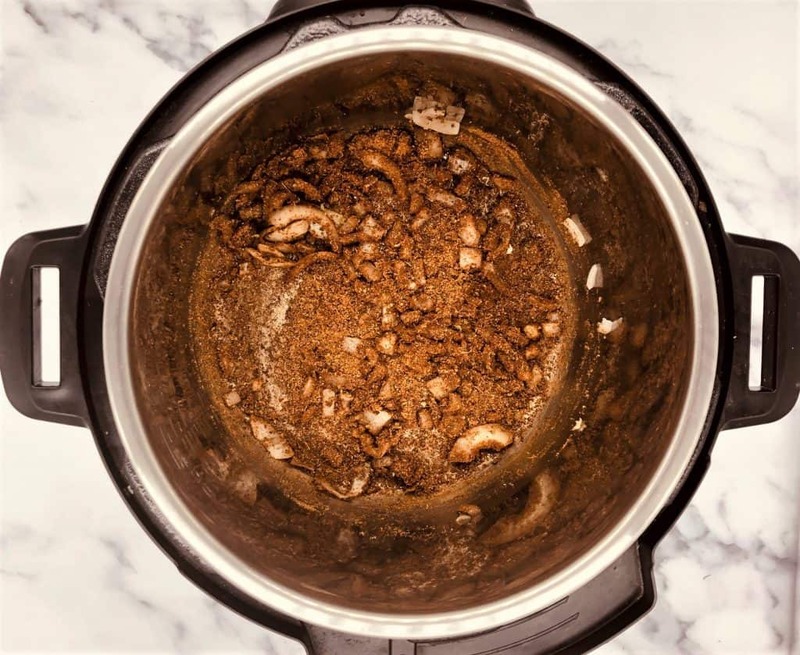 How Long Does It Take In The Instant Pot? This recipe has very minimal preparation time, just a case of chopping up the onion and crushing the garlic. The sauteeing step takes about 5 minutes all in (onions, garlic, spices and chicken). 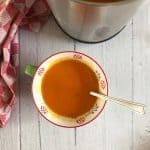 Cooking in an electric pressure cooker is quicker than other methods, but what a lot of the marketing doesn’t reveal is the time needed for the cooker to get up to pressure. 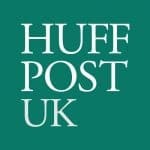 How long it takes is dependent on what you have inside, that is, the quantity (large volumes will take much longer), as well as the temperature of what’s inside. 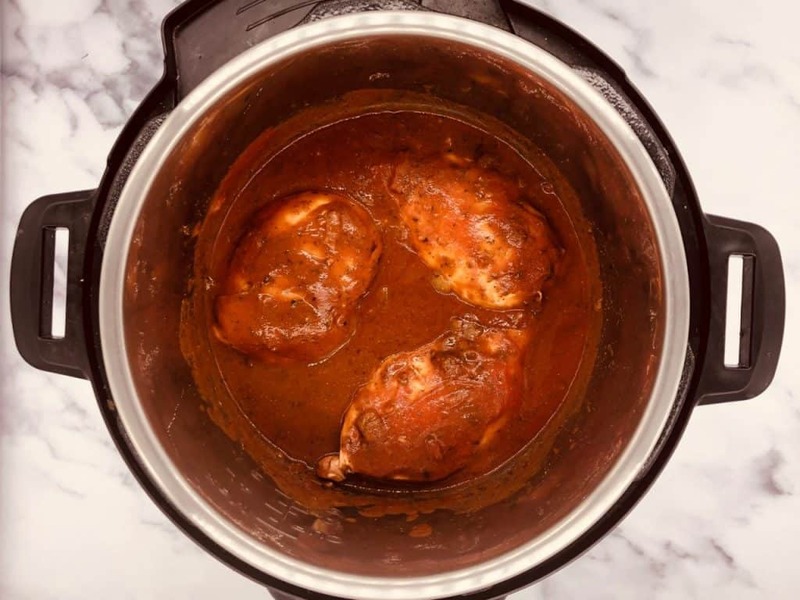 For this chicken tikka masala recipe, the Instant Pot took 6 minutes to get to pressure. I then set it for 7 minutes at high pressure with a quick release at the end. It was then left on the saute function for about 5 minutes whilst I shredded the chicken breast. This also gave the sauce some time to boil down and thicken up a little before adding in the cream (or your chosen substitute). 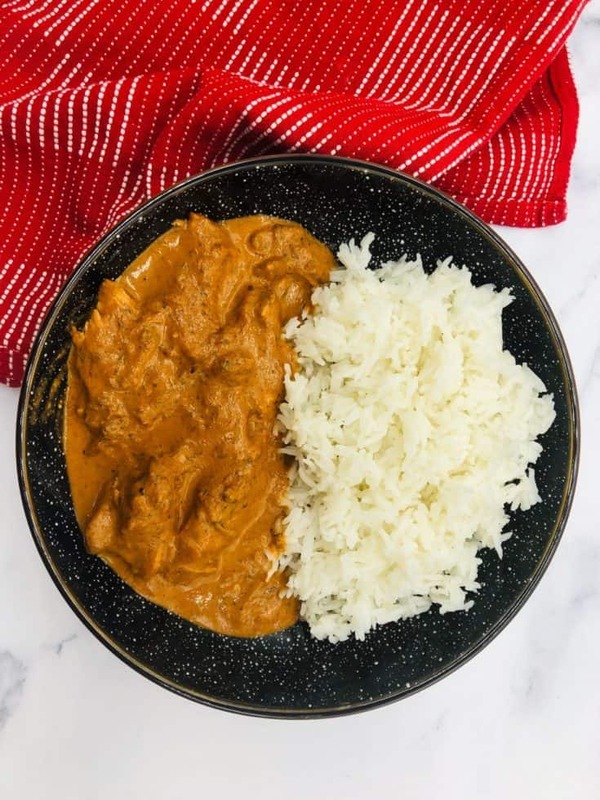 This easy chicken tikka masala is even quicker to make in an Instant Pot! 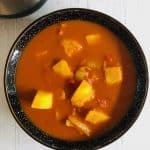 With very few ingredients and steps to follow you'll be tucking into this yummy curry in less than 25 minutes. Heat the oil in the pressure cooker pot using the saute function. Add the onions and garlic and cook until softened (about 3 to 4 minutes). Add the tikka masala spice mix and continue to saute for 1 more minute. You might need to add a little stock at this stage to deglaze the bottom of the pot. Add the chicken breasts to the pot to seal them (about 1 minute on each side). Add the passata and chicken stock and allow to come to a gentle boil. Switch off the saute function and put the lid on the Instant Pot. Set the Instant Pot on high pressure for 7 minutes. It should take about 6 minutes to come to pressure. When the cooking time is up perform a quick release. Take the lid off and take the chicken breasts out. Switch the Instant Pot to saute mode to allow the sauce to thicken up a little. Whilst the sauce is boiling down, shred the chicken breast up. 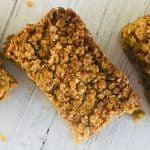 It should come apart easily as it will be nice and tender from the wonders of the Instant Pot! 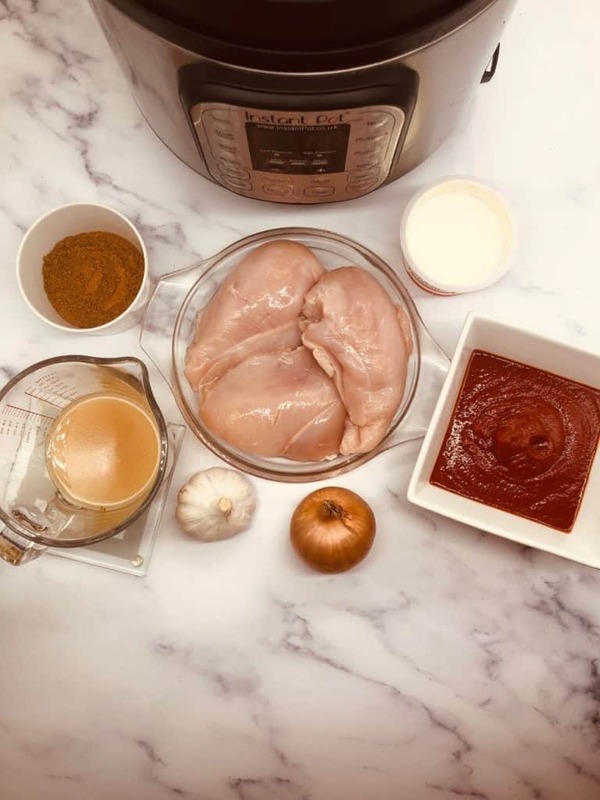 Return the shredded chicken to the Instant Pot and stir in. Switch off the saute function and remove the inner pot from the Instant Pot. Stir in your choice of cream, yoghurt or coconut milk. Garnish with chopped coriander (optional). Simply mix it all together! I used 1 chicken stock pot in 150ml water, ignoring what the stock pot instructions told me to do. This will add more yummy flavour to your final dish.